What Can We Learn from Breaking Wave Noise? Waves breaking on the ocean, often called “whitecaps,” limit the growth of ocean waves, transfer momentum between the atmosphere and ocean, generate marine aerosols, increase ocean albedo and enhance the air-sea transport of greenhouse gasses. Despite their importance for understanding weather and climate, they remain poorly understood. The reason for this is clear: breaking waves are the product of storms at sea, they are a source of intense turbulence and they can destroy the sensitive instruments we might use to measure them. This makes them tricky to study in their natural ocean environment, and has encouraged the development of various remote sensing techniques using aircraft and satellites. While we have learned much about breaking waves from above, we still need to understand what is happening in the turbulent core. Here we probe the whitecaps’ inner structure from beneath using the natural sound they create. The mass of bubbles that give the whitecap its bright appearance come from the air entrained as the wave breaks. The breaking process generates intense turbulence that fragments the trapped air cavity into a mass of small bubbles. These bubbles create underwater noise. The sounds of crashing surf, the tinkling fountain and the babbling brook are all made by bubbles, which emit a musical pulse of sound when they are first formed. Each pulse of sound has its own tone that is determined by the size of the bubble making it. So, wave noise intensity and frequency contains information about the numbers and sizes of bubbles entrained by a wave. By measuring the sound safely beneath the fury of the ocean surface, we can learn what is going on within its turbulent interior. Wave noise has been used over the years to learn many interesting things about breaking waves, including their intensity, how frequently they break and their movement across the sea surface. Wave noise has been used to probe the properties of recently formed bubbles left after a wave breaks and even to infer wind speed, which is closely related to the overall intensity of noise in the ocean. We have been using wave noise to probe fluid turbulence in whitecaps. Our interest in whitecap turbulence is motivated by its relationship to bubble entrainment and breakup. Fluctuating pressure within the breaking wave driven by fluid turbulence can rupture bubbles by distorting them from their spherical form into irregular shapes. Small bubbles are stabilized against rupture by surface tension, but large bubbles get ripped apart. These two forces are balanced at a spatial scale, the Hinze scale, which is related to the intensity of the turbulence. The Hinze scale plays a key role in setting the bubble size distribution in breaking waves. 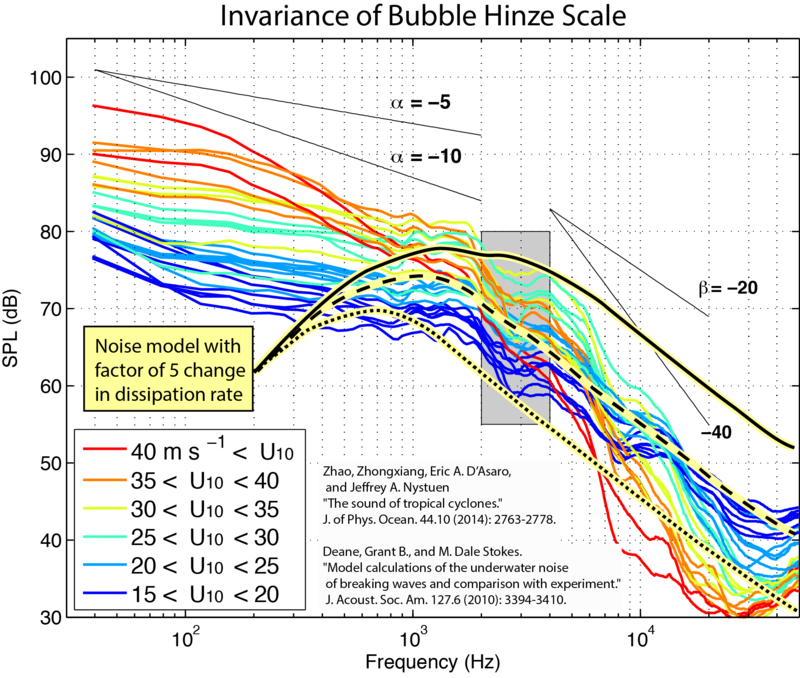 An important question is how does the Hinze scale, and therefore the bubble size distribution, change as the wind grows from a gentle breeze to a tropical cyclone? We might reasonably expect the turbulence to increase with increasing wind speed. If this were true, the bubble distribution created by wave breaking would lead to smaller bubbles at higher wind speed. Surprisingly, this turns out not to be the case. Our experiments on breaking waves in a laboratory show that turbulence intensity in breaking waves, measured by both bubble sizes and a quite different method, reaches a maximum value, relatively independent of the size of the wave. This leads us to suspect that the Hinze scale, and therefore the bubble size distribution, should be the same for a wide range of wind speeds. We call this phenomenon “turbulence saturation,” and it has important implications for transport processes linking the ocean and atmosphere. But, does this result translate from the laboratory to the open ocean? Field measurements support this hypothesis. Wave noise was measured along 7 transects across 3 different tropical cyclones. Figure 1 shows measurements of wave noise as it depends on frequency for different wind speeds (colored lines) varying from 15 to 40 meters per second. Notice that all spectra change slope between 2000-4000 Hertz, annotated with the vertical, grey box. The frequency of this break point is thus nearly independent of wind speed. 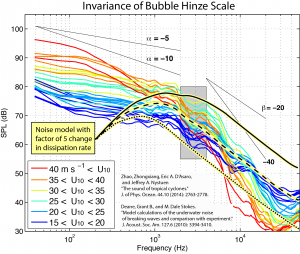 Since we expect this frequency to be related to the Hinze scale, these data suggests that the Hinze scale, and therefore the bubble size distribution, is the same across the entire range of wind speeds. We support this conclusion with a model of sound generation by bubbles (yellow/black lines). The model predicts a peak near the Hinze frequency. Sound generation at lower frequencies is due to other physics and not modeled here. Changing the turbulence dissipation rate by a factor of 5 moves the location of the peak by about a factor of 3, suggesting that if the turbulence intensity did change then we would see evidence of it in the wave noise. This combination of laboratory and field measurements with theory provide us with evidence of “scale invariance” of turbulence within breaking waves in the open ocean up to 40 meters per second wind speeds, supporting the turbulence saturation hypothesis and demonstrating the unique contributions that ambient sound measurements can make under severe conditions. [Work supported by ONR, Ocean Acoustics Division and NSF. Any opinions, findings, and conclusions or recommendations expressed in this material are those of the authors and do not necessarily reflect the views of the National Science Foundation or the Office of Naval Research]. Figure 1. Measurements of wave noise for wind speeds ranging from 15 to 40 meters per second. The black curves show model calculations of the wave noise under conditions of changing turbulence.